Welcome to the July/August 2016 Edition of Flatpicking Guitar Magazine (Volume 20, Number 5). In this issue we are proud to feature the legendary Norman Blake on our cover. We also feature Italian flatpicker Beppe Gambetta, Nashville’s Jeff White, and a young flatpicker Megan Cody from Colorado. Jeremy Fritts, from east Tennessee is in this issue as a guest columnists and all of our regular columnists also provide some great material for you to work with this summer. 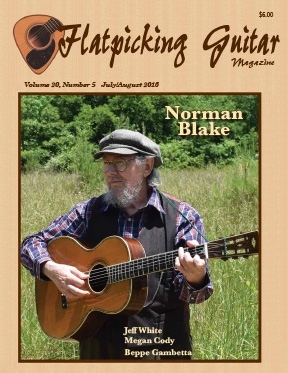 We hope you enjoy this issue of Flatpicking Guitar Magazine.